Priceless. I love her expression. Also like the light angling down to the camera/phone. Lovely advice! I look forward to sharing my joy of photography with my future child. Reminds me of the documentary "Born into Brothels." u\'ve stated the right thing. We r taking away the creativity of our children by not allowing them to do what they like to do and forcing them to imitate other thing instead of leting them to create their own ideas. I really love the idea of viewing through the eys of children. I\'ll try this for sure in right time. 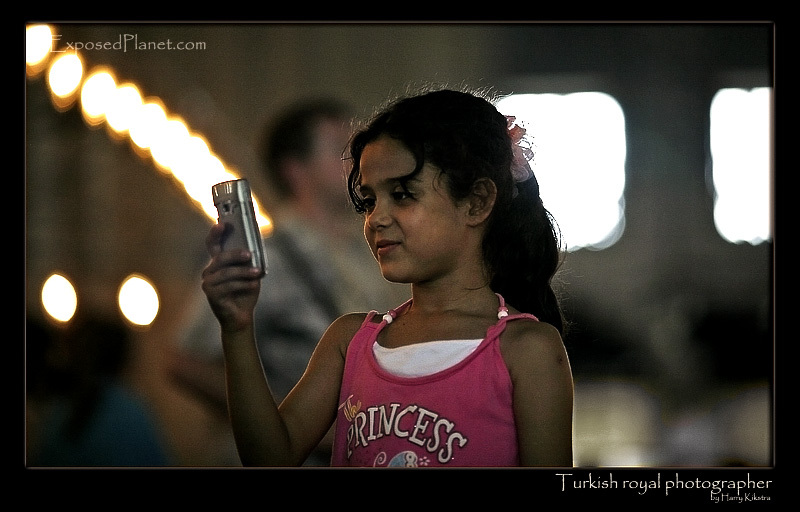 The story behind "Turkish Princess taking pictures"
With all the cheap digital cameras and the inclusion of cameras in phones, children can also enjoy the wonders of photography. Please stimulate your children to look through the viewfinder (or on the screen as nowadays is more applicable). Get them a camera and let them capture their world. Teach them where needed, but do not criticize their view on things. Look through their eyes, you might be surprised what a child finds important enough in life to shoot. This self-appointed Turkish princess shot exactly the other direction than all the grown-ups did in this mosque. Your child will learn to appreciate the opportunity to take time to watch one scene in its life and capture and cherish it, which is a rarity in the current age of fast food menus, 24-hour cartoon channels and violent computer games we created for them..